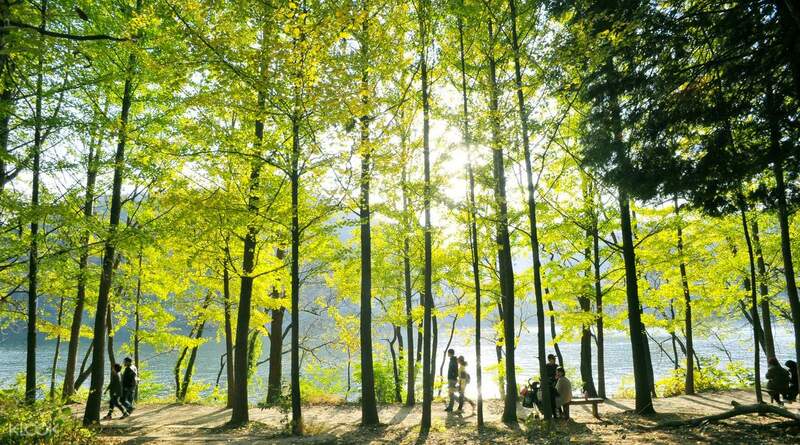 We have seen many foreign travelers who wanted to visit both Namisum (Nami Island) and Petite France in a day. However, many of them didn’t know how to make the trip because they didn’t have enough information of local transportation. As a result, many of them visited either Namisum or Petite France only. Let’s start with this map and get an idea where we are going. You should be able to find Nami Island and Petite France on the right upper side of the map (click map image for large image). Now, you may think that ‘oh, this is quite far away!’. Yes, it is not very near from Seoul. We will make about 1.5 hours trip to Nami Island from Seoul. For a day trip to 2 places, we will take train which is called ‘ ITX 청춘(Cheongchun)’ from Yongsan Station or Cheongnyangni Station which are respectively second and third largest train station in Seoul after Seoul Station. For step 1, let’s zoom in above map and take a look at Seoul area only. Can you see where Yongsan Station and Cheongnyangni Station are? Then, you should be able to find which station is easier to reach from your ‘home away from home’. 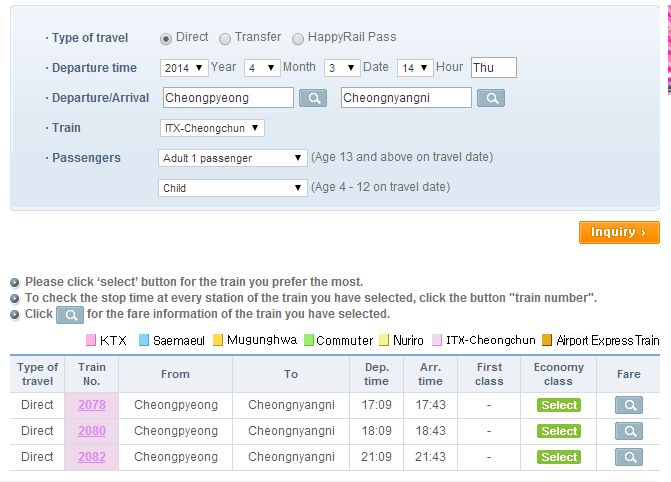 You can book ITX 청춘 Train tickets online if you want to make sure comfort seats. Otherwise, you can buy tickets at station. However, we strongly recommend earlier online booking! To book train tickets online, please read following blog posting. It is very comprehensive and easy to understand! For planning, let’s see train time table and train fare. Price? It’s not expensive at all! We strongly recommend to take ITX train at 8:00(Yongsan)/8:16(Cheongnyangni) to make sure enough time in Namisum and Petite France. If you are not keen to spend more time at each destination, take 9:00/9:16 train. We will skip ‘how to take ITX 청춘 train’ because you can find many blog postings about it. Search from Google! Note] Don’t be confused. This table has Typo ‘Nam-E Island’ which should be ‘Nami Island’ or ‘Namisum’. After you arrive to Namisum, enjoy the island as this web site tells. To visit Petite France, you need to take Gapyeong Tour Bus at 13:15, 14:15 or 15:15 (bus leaves at the bus station after ferry jetty and car park). Please consider return ferry waiting and boarding time which sometimes takes quite long. Bus at 14;15 looks reasonable in our view. After you arrive to Petite France, you enjoy the little France as this web site introduces. Not to miss ITX 청춘 train to Seoul, you have to take Gapyeong Tour Bus again (to Cheongpyeong direction) and get off at Cheongpyeong Station. As you see train time table below, you have 2 options. To minimize risk, we strongly recommend to book train ticket earlier at www.letskorail.com (choose your language on the top right, then click ‘Rail Tickets’ instead of ‘KR Pass’). How do you think about our schedule suggestion? We would welcome your blog posting after the day trip. Now we are offering a shuttle bus from Seoul to Nami Island and Petite France! Lowest Price but Different and Excellent Tour Program !! The shuttle bus will pick you up from Seoul Station or Hongik University, and take you to both destinations! This entry was posted in BnBHero Discounts, BnBHero Services, Tour and tagged Cheongnyangni Station, Cheongpyeong, featured, Gangwon, Gapyeong, ITX, ITX train, ITX 청춘, Nami island, Namisum, Petit France, Petite France, Yongsan Station. Hello I want to ask why we should go down at cheongpyeong station rather than gapyeong station to go back to seoul? I’m really slow 🙁 help me understand. 🙂 Thanks!! Hi! Thanks so much for the comprehensive information. I’m planning to go to nami + petite this June 29. But btw, do you know how much it will cost to take a taxi from nami to petite? Just in case we want to spend more time in nami and don’t want to worry abt the shuttle bus schedule. Thanks!! It will cost KRW 20,000won by taxi from Nami island to Petite France. Also, similar price from Petite France to Cheongpyeong station. Hi, There is public transportation, but you have to take 3 buses to go Nami island. So we recommend you to take a taxi. It will costs KRW 20,000won and take 30 min. just 1 time, you can take a bus all day. I would like to ask that, if lets say i go according of your itinerary. And when i take the tour bus again to petite france from namisum, do i have to pay ₩5000 again? or is it just one time payment from where i get on from? It is just one time payment. Hi..thanks for this blog. It helps me alot.. I planning to visit the morning calms garden during lightning festival this coming january2017. Do you have any idea, if there’s still available train or bus after 8 pm back to seoul?i will be staying at Incheon hyatt hotel. 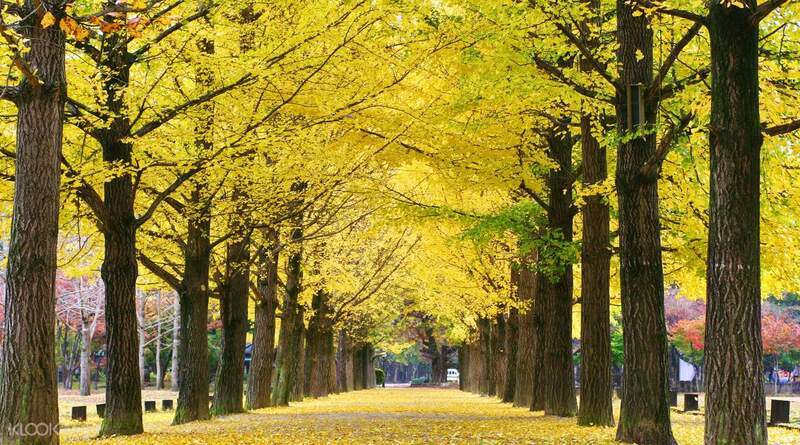 What city is nearest to nami island seoul or busan?pls help thanks alot. Ps:if i will be in incheon hyatt hotel what train or bus station that close to the hotel going to nami?do u recommend a day bus tour ?thanks for your reply. You can find more information about the transportation in this link. Also, Seoul is more closer than Busan. Incheon is west area of Seoul. But Nami island and morning calm garden is east area of Seoul. I think you should better book the hotel in Seoul, not Incheon. Hi there! I will be travelling from Myeongdong to Gapyeong station. Is it a must to travel to Gapyeong with ITX? Thank you. You can take a subway to Gapyeong station, but it takes really long time. So we recommend you to take ITX train. Are the tour buses usually packed with people? I’m travelling with 5 other adults and 2 children. Wouldn’t want to miss the bus due to shortage of seats. Would appreciate your reply on this! On weekend, there is lots of Korean tourists. But on weekday, we think there is available seats on the bus. can i use itx train to gapyeong from seoul station? and the station name is “seoul” on booking online website? Hi, is it possible if we want to include morning calm garden in one day trip? Any advise ? Thank you!! Hi, can I take normal train from Cheongpyeong back to Honggik University (with transfers in between), are there many timings for the normal train between 6 – 10pm on a weekday? Hi. Would it be possible to add Garden of the Morning Calm to this itinerary? 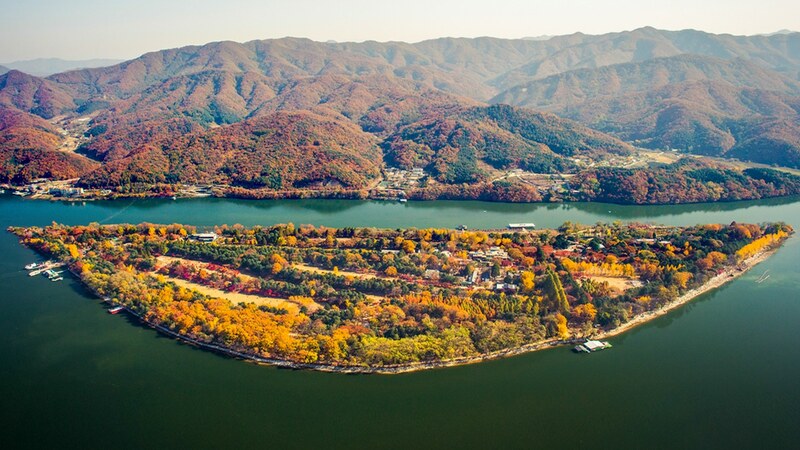 In other words, Nami Island, Petite France, and Garden of the Morning Calm can be visited in one day from Seoul. Hi! it’s possible to include the garden of morning calm. When i visited S.Korea last January, we visited nami island, petit france and garden of morning calm in just one day. Just don’t forget to be time-conscious to be able to get on the last trip of the Gapyeong tour bus to Cheongpyeong Station. 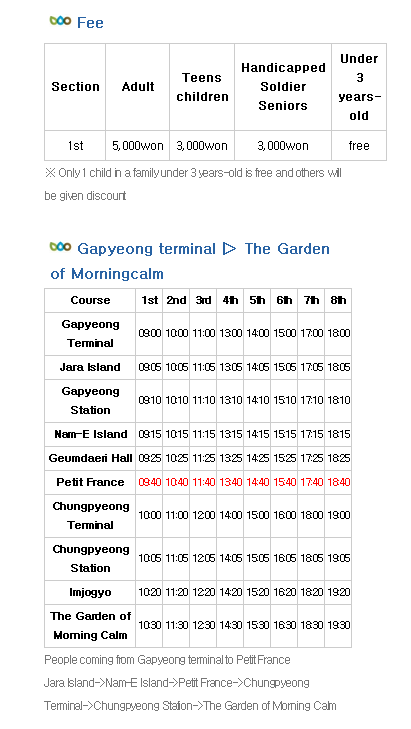 Do we take the ferry/bus to Gapyeong station instead of Cheongpyeong station.? Hi, can you pls advise how long is the bus ride from PF to Gapyeong station? It will takes 40 min. Hi which station is near the station Nadaemun market station to nami island and petite? How long from Nadaemun to the station?? if from Hoehyeon (Namdaemun Market) station which one is near to proceed (yongsan or cheongnyangni station) and how long? Go on Saturday to nami island and petite OK? ? Would like to know if I go from Gangnam station. Which station near to proceed to Nami island thereafter to Petite France? Take how long from Gangnam station to Yongsan station?? We recommend you to take ITX in Cheongnyangni Station. It’s more closer than Yongsan Station from Gangnam station. It will take 30 minutes from Gangnam to Cheongnyangni Satation. if you take a taxi from Petit France to Gapyeong station, it will cost KRW 15000(USD $13). Of course you can buy on the bus. 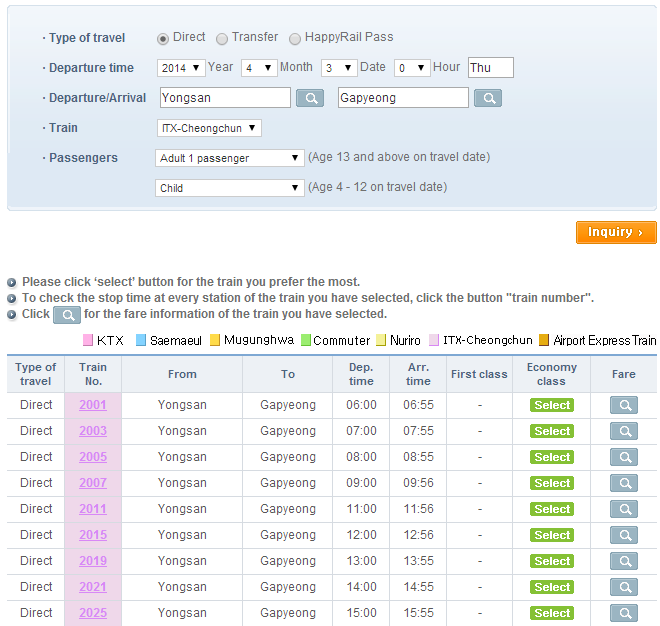 Are the buses generally on time/reach on time and is it easy to find the way to the train back to Seoul @ Cheongpyeong? On the way back to Seoul from Petit France, the bus will arrive at Cheongpyeong at 6:05pm. The train to Seoul is 6:09pm. That means 4mins to play around only. Is that too short? Buses usually runs on time but you’d be better to consider some buffer. May I know what you mean when you said “there are many trains before the next ITX train”? I understand that there is an ITX train arriving at 18:09 and the next one is at 21:09. Do you mean to say that between 18:09 and 21:09, there are other trains arriving as weLL? It’s a daily ticket. You can ride tour bus as many as you want in a day. Its website is http://www.gptour.go.kr but it doesn’t seem to be down at the moment. Hi! I would like to ask if there is a need for a credit card in booking for ITX? Is it difficult to get a ticket by the counter? You can get a ticket at station counter but you would be better to book online earlier if you want to secure seats in high season or weekend. In case of seats sold out, you will still be able to get flexible ticket (which may mean standing ticket) at the counter. You can book ITX at http://www.letskorail.com . Beside using Gapyeong Tour Bus from Namiseom to Petite France, is there City Bus to go there? And how about taxi? How much cost to have pay from Namiseom to Petite France. For your info that I will go in a group (4 people). They have public bus from Nami to Petite. But you have to transfer 2 times to get there. So we recommend you to take a taxi or city tour bus. It will costs KRW 20,000 won approximately. If you use tour bus only 1 time, take a taxi would be better for 4 people. Hi, I will be going for Miasageori station, do you still recommend to go to Yongsan Station to take ITX to Gapyeong Station? Then Cheongnyangni Station will be closer than Yongsan station. Would you advise if we can do Petit France first then Nami Island? or is there any other way that u recommend for returning to Seoul from Petit France (other than ITX)?! Can we use t-money in all of those transfers?taxi cab and buses? GMC is bit far from public transportation and other places. If you want to visit GMC as well, you will need 2 days. Many people say that GMC is to far for a day trip using public transportation from Seoul although they didn’t visit other 2 places. thanks alot for the infor! Tks very much!! Would you suggest to take train from Gapyeong instead if there are earlier slots? We have 15 of us so trying to arrange properly. I tried to book the train from from Cheongpyeong station to Cheongnyangni Station but only got 14.39pm and 20.07pm timing. I have to choose 20.07pm instead. Is there any place for dinner at Cheongpyeong Station? Even if tickets are sold out, you can still buy flexible ticket (you can sit any vacant seat, otherwise standing) at train station ticket box. If you want to have dinner near Cheongpyeong Station, There are restaurants alley near Exit 1. Thanks for your useful information. Like it. Hi, can i check if the KR Pass can be used on the ITX Cheongchun Line? Thanks. You can use KR Pass to ITX Cheongchun line. Can I check with you, when i come back from Petite France, can i take back to Gapyeong Station instead of Cheongpyeong Station and I can take ITX to Yongsan station as it is closer to my hotel? Or is it a one way train route? How much the taxi cost from nami to petite france? It just meant that you have to take right bus on time to catch train to Seoul. You can take either of following options on the way back to Seoul.